5 Ways Your Crawl Space Can Affect Your Health | News and Events for Basement Systems, Inc. Mold, water or pests in the crawl space? HVAC ducts and the Stack Effect can pull crawl space air into your home. When is the last time you looked inside your home's crawl space? If you're like most homeowners with a crawl space under the home, this dark, musty pit filled with cobwebs, spiders and who knows what else, probably isn't a place you visit very often, or at all. If there's a problem in your crawl space, such as flooding or moisture, it could be a long time before you know about it. What happens in the crawl space stays in the crawl space, right? We wish. Several studies have shown that as much as 40% of the air in your home comes up through the crawl space. This means that moisture, mold, dust, and pathogens can seep into your home, where you're breathing it in. Asthma or allergy symptoms could be a response to this. Problems in your crawl space can have a major impact on your family's health in more ways than you might think. Whether it's from standing water after a rainstorm or just the dirt floor, evaporating moisture can damage wood and insulation and eventually make its way into your home. Mold in the crawl space and upstairs living areas is a common problem caused by excess moisture. 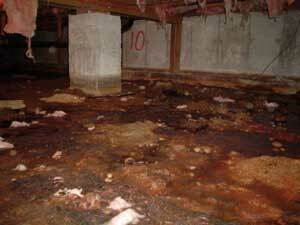 Moisture in the crawl space is a magnet for spiders, mice, rats, snakes, termites and other nasty pests. Because the crawl space is usually left undisturbed, this provides a safe haven for critters looking for a cozy home. What's more, much like our kids, critters don’t usually clean up after themselves. Pathogens from rodent droppings ad urine can affect the air quality inside your home. You can't see or smell radon gas, but it's found in almost all soils. It comes from the natural decay of uranium and it moves up through the ground and into the air above and eventually into your home. Studies have linked radon exposure and lung cancer. In fact, radon is the number one cause of lung cancer among non-smokers, according to the Environmental Protection Agency (EPA). If the air outside is worse than the air inside, then vents into the crawl space will let this polluted outside air into your crawl space and eventually up into your home. The poor air quality can make allergies, asthma and respiratory issues worse. If the ducting for your HVAC system is running through the crawl space, it acts as a highway, carrying all the dust, moisture, rodent droppings, and chemicals from the crawl space directly into your living space and your air. Ducts that are well-sealed shouldn't be an issue, but the reality is that ducts in the crawl space are usually poorly installed and unsealed. Ducts carrying cold air through a humid crawl space can mean condensation problems. Problems in the crawl space affect your whole house. By checking the crawl space and taking care of any issues, you'll ensure a healthy home for your family. The best solution is to encapsulate the crawl space with a durable liner, like Basement Systems' CleanSpace vapor barrier, which helps keep out moisture, radon gas and odors. Installing a drainage system and sump pump can help keep water out of the crawl space. Find a local crawl space contractor to help you improve the health of your crawl space today! The Basement Systems Network has more than 200 contractors across the United States and Canada who specialize in crawl space encapsulation and other crawl space repair services. These professionals offer on-site evaluations and written estimates. They will recommend the best crawl space solution to fit your home's specific needs.